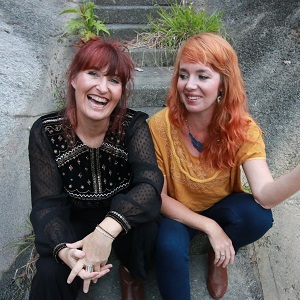 Lisa Lazuli (Yamba) and Lizzie Flynn (Brisbane) come together as Fly Little Sparrow to sing harmonies that emulate riding on the wings of a strong-willed bird. Heading on a flight path of beautiful harmonic arrangements, their eclectic repertoire and commentary will take you on a journey from fragility to hope. Lisa Lazuli, was a part of Triple J's first unearthed band 'Ode to a Goldfish', which saw her supporting acts like The Finn Brothers, Christine Anu, The Whitlams and many others. Lisa has also supported acts as a solo artist like Jeff Lang, The Idea Of North, and Lucie Thorne. Lizzie Flynn writes songs that blend a little satirical storytelling with a lot of joyful emotion. She has been a vocalist and songwriter for a variety of bands and theatrical productions, and has performed at music festivals throughout Australia, including The Planting (Woodford 2018), Maleny Music Festival (2018) and Illawarra Folk Festival (2019). Email: Please contact Fly Little Sparrow through the website.